This blog is autobiographical in nature although dedicated to Parmeshwar, Param Pita Parmatma, the eternal Lord and Divine Father of this creation. Nonetheless, it is inspired and telepathically imparted by none other than Yogeshwar, Shri Mahavatar Babaji, the greatest Himalayan Yogi. It depends on the aspirant how much he or she is able to decipher from the personal anecdotes so often narrated here to clarify something and drive home the point. They give a fair idea about the life, trials, tribulations, devotion and aspirations of a steadfast yogi or a dedicated, consistent aspirant on the path of Self Realizations and her progression to thoroughgoing. It is all about how much you want to travel on the path which will take you to God. It is all about how much desire you hold to seek, seek and seek. Total one pointed focus, dedication, determination and unfailing faith in oneself and God as well the Spiritual mentor and gurus are prerequisite conditions on this path. The foremost important trait of full surrender to God and the Holy Masters should also be remembered and practiced to know what Truth is if you wish to do so. Truth has many manifestations. Truth has many aspects. Truth is hard to know. Truth is simple and easy to grasp if the seeker has cleared his bundles of negative karmas with her or his own wish. This job cannot be done by anyone else but depends on the willingness of the pursuing aspirant. Be it today’s Paramhansa Yogananda or Swami Ramakrishna Paramhansa or Maharishi Shri Aurobindo, they all have one thing in common. They only pursued God. God was their prime need, prime focus and prime goal in life. It is mandatory to become so resolved and persistent if God has to be pursued in one life. Truth about God is known after the cleaning process of the innermost level is completed. Astute judgement of falsehood and Reality, impermanence of Nature and the world and the infallible Truths of the Supreme Force ever present in the Universe are imperative to know by the sincere one. The unprecedented fury of Nature and its wrath on humans left me completely stunned and bewildered when it struck India’s Uttarakhand area on 16th June’13. My first thought that sprang up was why God was so angry. What have we done so wrong? A little later, I become aware that Shri Mahavatar Babaji must have been definitely aware of this pending disaster because of which he had asked me to write a whole section on my blog titled ‘Our lost heritage’ Segment D, much in advance to tell us how important it has become today for all of us to ensure that we become aware and make a holy habit of serving God and Nature as our spiritual duty. He has been quite concerned about the fast deteriorating quality of human race’s life because of excessive deforestation, world population boom, electronic age, consumerism, excessive corruption in daily lives and lack of basic amenities not yet able to reach every person in the world. He genuinely cares for our planet and has been serving it since a very long time. Formally, Shri Mahavatar Babaji came in my life in 2002, but prior to that also he has been guarding me, keeping a vigilant eye over my life and was waiting for the best time to come when he could reveal and teach me the ultimate Truths when I became ready. He took it upon himself to make certain that I sail the ocean of delusion, that I get enough strength from him to cross over the heaps of adverse karmas that were still to be reaped and the wisdom that followed after these trying procedures would be mine. It was at this juncture that I was overwhelmed by his greatness, unconditional love and compassion that I was saturated with thoughts of returning something back, doing something for him as a gesture of gratitude. I assumed that he had already done so much for me that I must not look for more things as what he has done for me, nobody can do. I do not know any person who has in his capacity the capabilities to free you from your past and recreate a divine world on this Earth now. I have met quite a many people in my life who are devotees of some sannyasis, sadhus, Swamis, gurujis or a cult and who consider Shri Mahavatar Babaji as their Great Guru. They seem to be having one thing in common-they all see Shri Mahavatar Babaji as a God like figure. They consider themselves as trivial and put Babaji on a high pedestal like God and then they ask for all sorts of things to be fulfilled or wanted. They probably do not understand that the stature of Shri Babaji is virtually God like therefore we must not ask trivial things! We must know for sure what we must seek and request from this spiritual giant! For the reason that Shri Mahavatar Babaji is assigned huge tasks for the world as well as for the human race, the foremost being removing the darkness out of their lives, we must essentially ask for Grace so that we choose to become divine in nature! The aeons old darkness should be wiped out with his help and our miseries mitigated. Delusion is momentary absence of Light. We must seek him for Light, knowledge, a higher purpose of living this life. We must know the Truth of the Universe, of the sweet Lord, of the world we live in, of human evolution, of time, space, matter, mind, Creation etc.-those issues and topics that man has been grappling for centuries and yet has no answers and is troubled by them life after life. Shri Mahavatar Babaji has answers to all these human spiritual, yogic and occult pursuits. It is imperative that we understand that he is a yogi of the highest order and we must seek the Highest Truth from his vast ocean of mammoth wisdom and super intelligence. I have in the middle of my daily chores or sometime in my meditations been doing the chanting of ‘Om Namah Shivaya’ on behalf of others in the last week. I prayed to Lord Shiva to rid his devotees of their excessive burdens, hurdles or any mental or physical anguish so that they get some relief, happiness and spiritual assistance. When we begin to pay off our debts, the road to happiness and liberation seems too far sometimes. Every single seeker who lives his or her life after acceptance of divine will, undergoes a similar experience. Just after this, my mind got connected and became in tune with Lord Shiva, who very kindly once more appeared at my invocation to my utmost surprise and whispered gently, “Shiv ka avahan karo, Shiv stuti karo. Adhunik technology se dard zyada mila hai, mana mei ashanti adhik hui hai. Mansik takat ghati hai aur mana mei pareshaani, uljhan adhik hai. Pahele manushya ka mana swabhik hi shaant raheta tha. Aaj ka manushya dukhi adhik hai. Uski vedna adhik hai, woh apne padosi se bhi alag thalag ho gaya hai, woh swarthi ban gaya hai, usmei prem nahi hai. Usne raftar to bahut tez banali hai parantu uska mana shaant nahi hai. Mukti mei jab sanchit karamo ki gathari ka antim karma naash ho kar vayumandal mei vyapt hota hai, to mana mei bahut gahara dukh hota hai kyunki woh karma atyadhik kashtdayi hota hai. Eeshwar atyadhik dayalu hai, woh sanchit karam mei akhri mei woh hi karma rakhta hai jismei manushya ko pahele atyadhik dukh mila ho. Woh isliye aise karta hai kyunki unse hamara dukh dekha nahi jata, woh atyadhik dayalu hai. Aap sab mujhe pyare ho lekin tez rafter se jo bhi prani mujhe prapt karne ki prabal ichcha mana mei rakhta hai, woh mujhe sarvadhik priya hai. Tez rafter se veh hi mujhe prapt kar payenge jo apne aapko nirmal bana lete hai. Nirmal banna asaan nahi hota hai kyonki mana mei prem nahi hota. Kewal uske mana mei nirmal prem ubharta hai jo niswartha hai. Eeshwar prem hai. Eeshwar prem se bana hai, usmei prem otprot hai. Jitna manushya eeshwarya, maanviya prem se apne hridaya ko bhar leta hai, Eeshwar usmei utna hi prakat hota hai, woh aisa swayam karta hai. Eeshwar vahin prakat hota hai jo mana paavan ho kyunki woh swayam paavan hai. Logon ke mana mei prem kyon nahi paida hota? Kyonki woh swarthi hote hai. Unka apna laalach, apni khushi hoti hai. Aur jo sabko prem karta hai usey sampoorna shaanti prapt ho jati hai. “Invoke Shiva, sing and praise Lord Shiva. New technology has given man more miseries and agitation. Mental strength has diminished and the mind is more edgy than before. Earlier, the man was naturally calm. Today’s man is more miserable than the earlier one. His agony is more, he is not even friendly to his neighbours. There is no love in his heart. Though he has gained speed, his mind is not calm. During the last moments of liberation, when the last action or karma is being relinquished and gets disintegrated in the atmosphere, at that time the human being is in great distress because that last specific karma is very painful. God is very merciful. In the vast baggage of accumulated karmas, he keeps the very sad ones at the last level. He does this because he is very kind and compassionate and cannot see our miseries and woes. I love all of you but those devotees who try to attain me very rapidly with a great urge, he/she is my most favourite. Only those will be able to attain me swiftly who make themselves pure in mind. It is not easy to become pure because love is missing; there is deficiency of love in one’s heart. Only that heart becomes pure who is unselfish. God is love. God is made of love, God is saturated with love. The more and more Godly and human love will be filled in the devotee’s heart, God will manifest itself in the same proportion; and this God does on his own. God manifests only there where the heart is pure because God is Himself pure. Why does love not flow in people? This is because they are greedy and selfish. They live for their own happiness. But those who love everybody, that devotee achieves grave peace and tranquility. 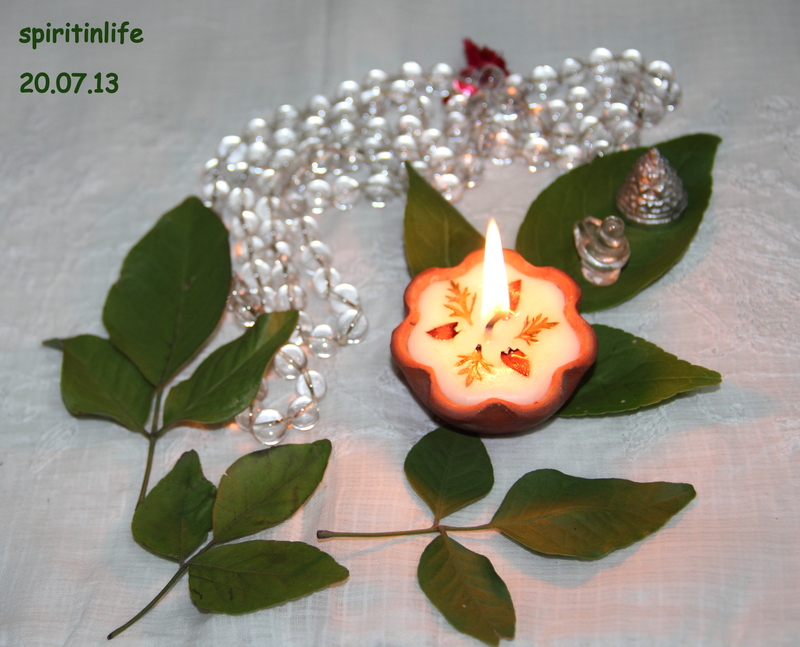 You are currently browsing the Spirit in life blog archives for the day Saturday, July 20th, 2013.